Get Involved! Become a Precinct Delegate! The role of a precinct delegate is one of the most important, yet, least understood of any elected office. 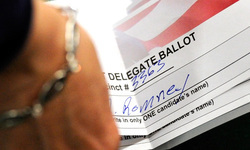 It is the active precinct delegate who wins elections for the Republican Party. Precinct delegates are elected directly by the voters of each precinct to serve as a bridge between voters and the Republican Party in your neighborhood and you represent your neighborhood at Republican conventions. Help people get registered to vote. Take information on issues and candidates to the voters in your precinct. Identify others interested in your party and recruit new party members. Help turn out your parties vote in your neighborhood on Election Day. Keep your party leaders informed about the issues that concern voters. Precinct Delegates are elected in the August Primary. Only Democratic voters choose Democratic precinct delegates and Republican voters choose Republican precinct delegates. Each precinct is allotted a number of precinct delegates based on past party voting strengths. Your district or county chair will be able to tell you how many delegate positions have been allocated to your precinct. Precinct delegate candidates file an Affidavit of Identity for ballot access. There is no longer a petition requirement for precinct delegate candidates. A precinct delegate candidate can file with the clerk of their county, city or township of residence. Your Affidavit of Identity must be notarized. Candidates for precinct delegate must file their Affidavit of Identity form with their clerk. The filing deadline for precinct delegate candidates falls on the twelfth Tuesday prior to the August primary. They are the campaign leaders for their party in their precincts. After the primary, those elected will be officially notified by the county clerk by mail. The notification will include the time and place of the district or county party convention, which will be held in August or September. Precinct delegates should take their official notification to the district or county convention to register with the convention credentials committee. District or county conventions will elect delegates to the state convention, scheduled usually for sometime in September. These conventions may also debate or adopt resolutions for recommendations to the state convention’s platform committee. The state convention in September will debate and adopt a state platform, nominate candidates for Supreme Court Justices, State Board of Education and university boards, and presidential electors. Find out the number of Republican precinct delegate vacancies in your precinct. File your Affidavit of Identity with your county, city or township clerk no later than 4:00 p.m, on the twelfth Tuesday prior to the August Primary. Find out how many delegates have filed in your precinct for precinct delegate. Your Affidavit of Identity must be notarized. If you have opposition, contact your neighbors, friends and family that reside in your precinct and ask for their support. Primary election day is the second Tuesday in August. Remember to vote! Fill out the Affidavit of Identity to get started!! !